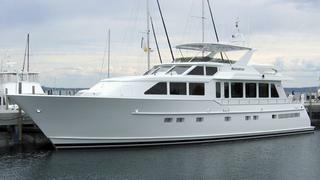 John Todd at Burger Yacht Sales tells me he sold the 25m motor yacht Motivation late in 2012 in an in-house deal, with Julien Elfenbein bringing the buyer. Motivation was built by Burger in 1996 and has always been a freshwater yacht, never operated in sea water. Twin 1350hp Caterpillar engines have 1000 original hours on them and enable a range of 2,000 nautical miles. A classic Burger interior in anigre woodwork sleeps six guests in three staterooms. Motivation was asking $3.45 million.